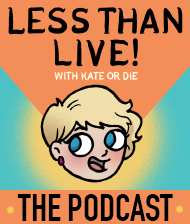 Small words | Kate or Die! I get asked pretty often about the honesty in my comics, and how I manage to balance what’s personal and what’s public. Here’s how: I’m really not very good at it. I just like to talk, I like to share, and I like to put my raw stuff on the table. I’ve been going through some heavy stuff lately, friends. Family things, friend things, some pretty serious health concerns with someone I care a great deal about. Is that vague enough? There’s cancer in my life and it is hard. I take it all in and I just keep compressing it, pushing it down and compartmentalizing. It’s not my problem, I’m not allowed to be upset. I’m not the sick one. I make it through the day. I work, I draw, I sweat, I fill my life with enough projects that I don’t have to be alone. I avoid quiet. That’s when the dark parts start creeping in around the edges. I don’t do drugs, but I drink. I’m usually okay, drinking. Lately, I’m not so convinced. This comic is a true story, about me completely freaking out and running out on a party in the cold at two in the morning by myself. It’s not the first time I’ve done it. I’ll probably do it again. I drink to forget and I start to remember. What’s that line about trying to drown your sorrows, but they just learn how to swim? It’s scary to share this stuff, but the scary stuff always means more. I draw this, I feel a little less alone.